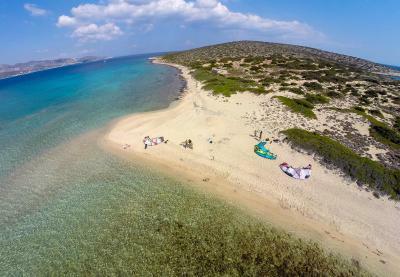 The Location was good because it was close to Antiparos. Also, the lunch service was good and we could eat by the pool. 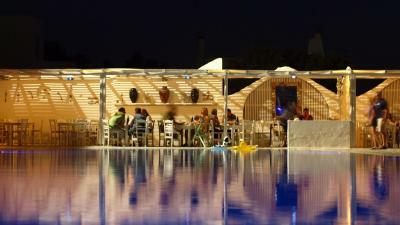 The hotel is beautifully located,close from the airport and just across antiparos island. The staff was very nice and offered all the necessary info about the island. Breakfast was fine with a good coffee . Loved the convenience of the nearby ferry to Antiparos and the bus to Parisian and other cities. Very nice staff. Great pool. Nice vibe around the breakfast which a great breakfast. reception service was fast and friendly. they got us upgraded from a double deluxe to a family room; not sure if this was good considering the level of noise we had to bear with you can get food at the hotel's restaurant at mid day, when all other nearby restaurants are closed free parking across the street from the hotel, but people leave the cars everywhere in Greece, so not something to choose the hotel for room A/C working and not noisy see view and room space. it's positioned in walking distance from the Antiparos ferry, which is fantastic; a few euros and some minutes later you are in Antiparos for a nice dinner by the sea - must experience. Holiday Sun Hotel This rating is a reflection of how the property compares to the industry standard when it comes to price, facilities and services available. It's based on a self-evaluation by the property. Use this rating to help choose your stay! Overlooking the Aegean Sea on the coast of Pounda, Holiday Sun Hotel offers a pool area and a water sports center where you can enjoy diving and windsurfing. Cool down in your air-conditioned room and enjoy the sea view from your private balcony. Enjoy a buffet breakfast, included in the rate. Go for a dip in the pool and soak up the Mediterranean sun. Spend some relaxing time in the sauna. 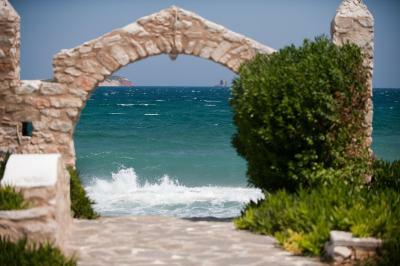 Take the short ferry ride to Antiparos and visit the tourist districts. 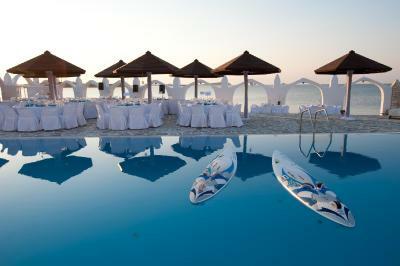 If you’re feeling adventurous, try diving or windsurfing with Holiday Sun Hotel’s water sport center. After a day of sun and sea, relax with a drink at Holiday Sun’s tavern. Enjoy Mediterranean and international cuisine at Sun Hotel’s restaurant. 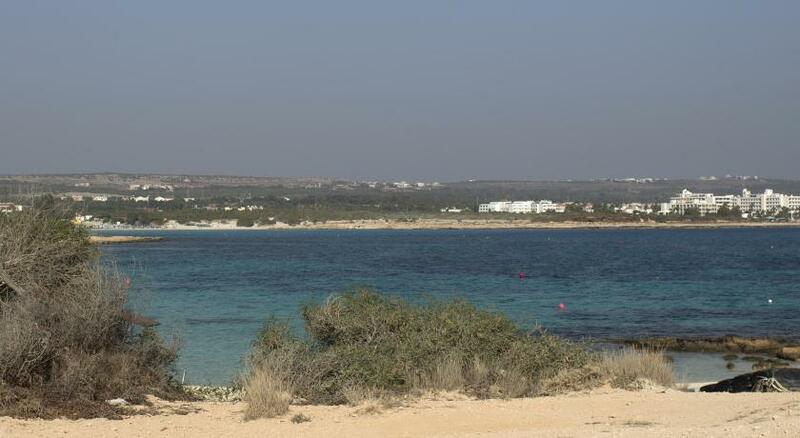 Holiday Sun Hotel offers a location next to the sea. It’s the ideal base for those wishing to escape the noise and fast pace of tourist areas. When would you like to stay at Holiday Sun Hotel? This room is with a balcony. Offering sea views from its terrace, this air-conditioned suite offers 2 bedrooms with attached bathroom, flat-screen TV and safe. 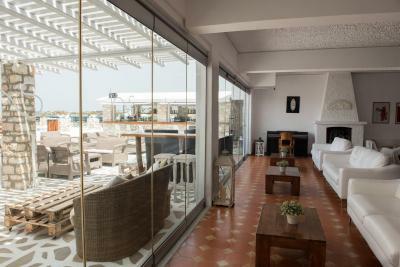 Opening to a terrace with sea views, this room offers a seating area and private bathroom. This twin room features a balcony, tile/marble floor and satellite TV. Opening to a balcony or terrace with sea views, this air-conditioned room offers a flat-screen TV and mini fridge. This double room features a tile/marble floor, view and patio. Opening to a balcony with sea view, this air conditioned room offers a flat-screen TV, mini fridge and a safe. House Rules Holiday Sun Hotel takes special requests – add in the next step! Holiday Sun Hotel accepts these cards and reserves the right to temporarily hold an amount prior to arrival. Kindly note that shuttle services are available upon request. Guests need to inform the property in advance with all the arrival details, as well as whether they will be carrying kite equipment with them. Uncomfortable pillows, and hairdryer dated and didn't work,. -There was a strong odour coming out of the toilet sink for the whole 11 days we stayed. The staff was responsive to our complaint but after a day or 2 the odour returned. -the deco in the room we were given was out of date -the same stands for the deco in otherparts of the hotel (e.g the chairs around the pool and the outside restaurant). Some of the hotel has been modernized and some not, so mismatch. -the swiming pool’s water was seawater. -electricity was dependent on the door key being on so the fridge (very small and old) was not working when we werenot in the room, which meant could keep anything cool. Very overrated for the price of a suite! Our room was near the kitchen vent and as a result we had loud noise through the day. Our experience with this Hotel was, unfortunately, such a disappointment.. During our four night stay every single night the sprinkle system that would start around midnight smelled like feces. The smell was so intense it was out of the question to stay outside of the room, and after a short while it would get inside the room through the A/C as well. What was even more frustrating is the response we got from the reception/the Manager, and the way they handled (or rather mishandled) the situation in general; by refusing to recognize that there was a problem at the beginning. Another issue we faced with were the cockroaches. We booked two rooms, and one of them had them coming through one of the pipes that connect to the outside. This room was eventually sprayed during our stay there…. Between this and the smell, we were finally offered to change both rooms for our last night; however that was impossible as we needed two lower level rooms (stayed with a 4 years old) Less significant issues to list are uncomfortable mattress, and wi-fi that semiworks only around reception area. This gateway was organized by us for our guests visiting from abroad; and honestly, we were ashamed and embarrass that it turned out that way. On a bright note; the property is beautiful! Pool area overlooking the beach is very cozy. Breakfast was outstanding, and bartender made the best mojitos! It could have been so much nicer, only “if”….. Through booking.com we were promised a room with sea view. We got an email a few days before that this would not be the case and because it was so close to our trip we could not cancel. The room was pretty small for what we got. The air-condition didn't always work properly. noisiest accommodation i ever had (ever, not just in Paros). you can hear all the cars on the street as if all windows were open, neighbors walking in front of the room and a water pump every few seconds, including during the night. try to sleep with that! i'm not even counting the planes flying over the hotel because those are just a few during the day. beds are very uncomfortable! mattresses are hard and if you sleep on your side it's like sleeping on wood/floor tap water has a strange smell; i understand it's not drinkable, but it's not even pleasant to open the tap and wash your face shower is at floor level, no actual hot tub restaurant food is average, nothing special sunbeds in the bar area use pillows that ofcourse are shared by everyone, not really appealing room fridge is old, but works breakfast is ordinary after you've tasted other options on the island. If you want to stay in this area, i think it will do for 2 days, but you're missing a lot in terms of gastronomy when compared to what the island can offer mosquitoes - in large numbers! probably hunted 20+ per night, just in the bathroom. there are no protections at the windows and the hotel is next to a deserted lot attracting insects because of humidity. The bed was very hard you couldn’t sleep all night. No wi-fi in the rooms an less you are room it was top of the reception room. Food was exceptionally good. Breakfast with a wide selection of delicacies. 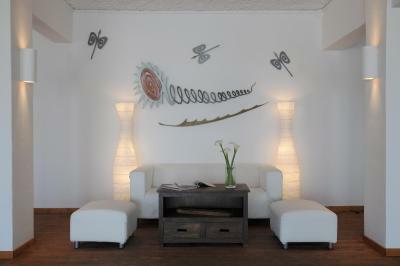 The building's interiors and exteriors very beautiful with a traditional Paros touch. Spent lots of time in the gardens. The sound of the waves of the beach just in front of the hotel makes your stay very relaxing. I'd defo go back. Even though the breakfast was sufficiently rich, a variety of fresh fruits was really missing. Very friendly personel. Walking distance to take the ferry to Antiparos. The room was very quite. You could hear the sound of the sea at night, which was very relaxing. The swimming pool is great.